Will we, won't we, maybe, ah definitely, not sure. The excitement in anticipation of the Sage Business Partner Awards on the 27th of April (the Sage equivalent of the Oscars!) was incredible. We never take anything for granted and just because we won the award in 2014, it didn't mean we would win again. If anything, it makes us more determined to keep winning. It keeps us on our toes. Myself and my fellow directors would like to show our gratitude and appreciation to our fantastic Sage 200 Team. For us, winning this award is not just about selling Sage 200, it's about identifiying the right solution to meet the needs of each of our clients. It's about solving real problems and making a real difference to our clients in how they run, manage and operate on a day-to-day basis. All businesses do things differently, so we need to be sure that firstly we have the solution that will solve our clients problems and secondly that we can deliver on what we have promised. Once the sale has been confirmed, our project manager steps in, takes over the reigns and makes things happen to achieve a smooth and happy implementation journey for our clients. Once our expert Implementation Team has done their bit, our Support Team takes over and ensures that any little problems, queries or hair pulling moments are dealt with promptly and professionally. That's what we are here for! Again, a big pat on the back to our wonderful team. So proud! 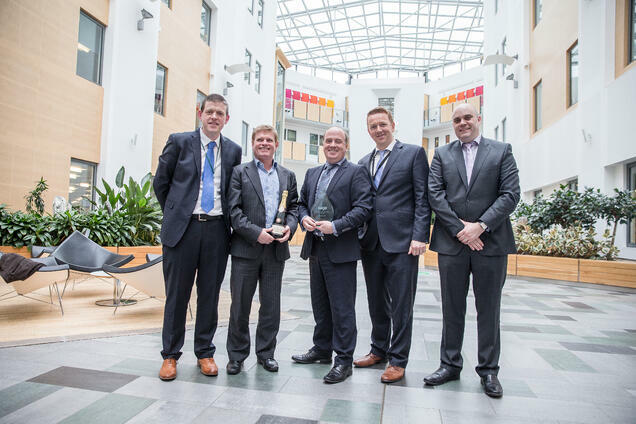 "Congratulations to both Peter Bergin, Ray Ryan and the team from Envisage Cloud on winning this award the Irish Sage 200 Business Partner of the Year FY15. Two years in a row. Envisage Cloud consistently prove that they are highly skilled in meeting client’s needs. Not selling Sage 200 the product but selling a solution that encompasses Sage 200. They are also highly proven in the important part, the successful delivery and implementation of the project and providing support to a high standard going forward, encompassing the “Customer for Life” virtues. Envisage Cloud are also innovative in their Marketing strategy. They are hosting an exciting customer and prospect event in the Aviva Stadium on the 8th of June supported also by Sage. We wish them well with the upcoming event. Well done again ! "